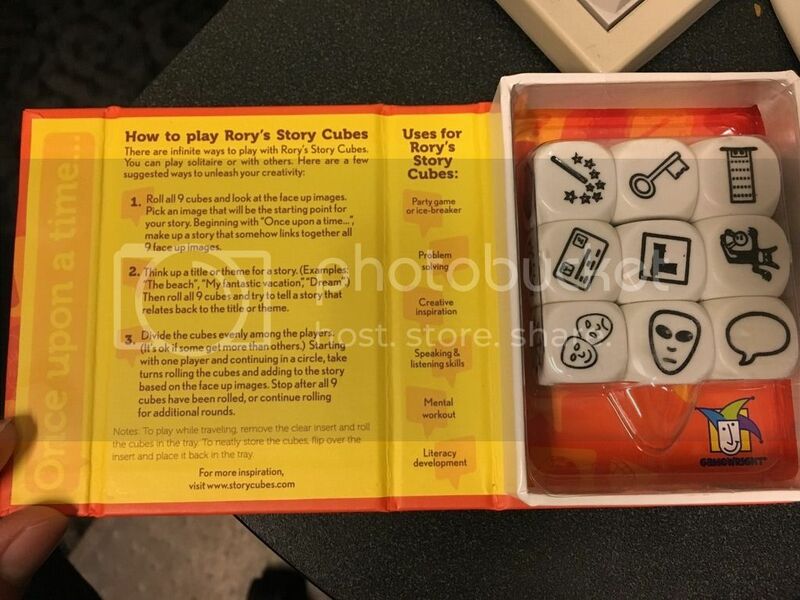 Over the holidays, I picked up a "travel" size version of Rory's Story Cubes. I was going to use it for a writing challenge to myself each month. I also thought it might make a new photo challenge for the group. Someone rolls the dice at the beginning of each month to set the challenge. 4) Another idea based upon what the story dice are currently showing. If we want to make this a writing challenge instead for the reading corner, I'm sure some stealthy person will move it over there. Recently I watched two video seminars on Creative Live aimed at inspiring creativity, specifically in photography. One idea was to get out and photograph things you normally wouldn't even be interested in. I can see how using this game as a starting point may force me to do just that... see things in a different way. I also have a set of "cards" that give different photographic assignment to complete, 52 in total. 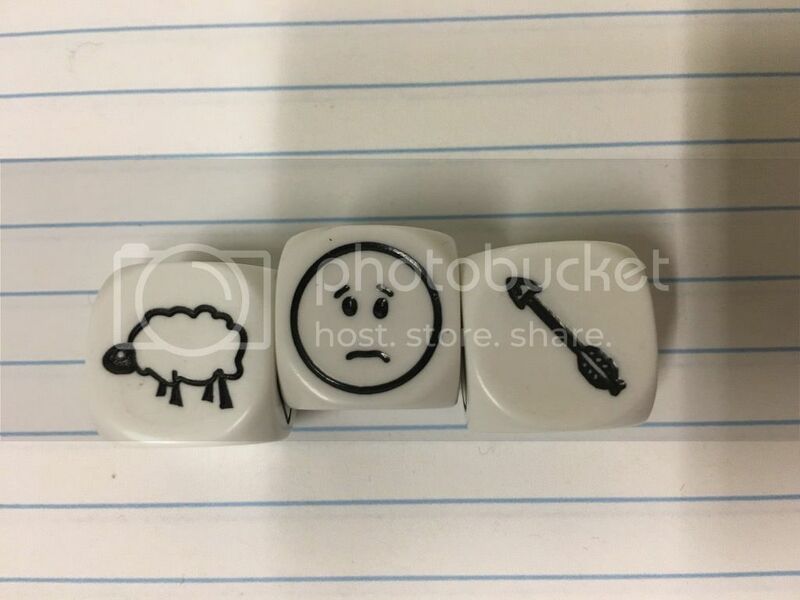 I figured the story cubes might be easier to ease into. It's a great idea! Don't really mind how we go about it. Whether we make a picture story using several of them or just use one for inspiration. Maybe we need our resident professional photographer and administrator to provide us with some input. Hey, if you mean Gatecon, he's not the only pro! For the first time, I recently had one of my photos used by a ballet company. Didn't get paid as it was more of a trade (access to them in return for them having rights to any of my photos), but think that counts. (ok, am bragging w red face, but had to get that in). All sounding like a fun idea to start the new year and agreed for now at least if Wily can do the rolling and post an image of the die for us to work from. Having the month to complete the project sounds good too. Maybe rolling say three of them then we could illustrate one, two or three in a single shot or create a triptych ?? Well, I rolled all 9, grouped them into rows of 3, and took a shot of the top row. He shoots sheep?! Noooooooo!!! At least he looks sorry about it. Edit: Oh now I see it. He is protecting the sheep but is unhappy he is now the target. okay, these dice are working. So, are we going with this throw as the theme for January? "He shot a sheepish grin"
Selkii, I'm impressed, you definitely qualify as our other professional photographer as your photo was used and also a trade is as good as getting paid! Do we get to see this photo? We could go with this theme for January. It may involve hiking through muddy fields in search of sheep but I'm up for that! Probably. Should it be an illustrated story or just photos? Maybe a very short story? "He bah-lated shot an affirmative response whilst grimacing." Thank you. I'm still waiting for ballet board permission to release all my photos. There have been a series of events slowing down the process. I've been shooting dress rehearsals for the company for about two years at the invitation of their ballet master just because she likes my landscapes and despite the fact I told her I didn't have the slightest idea how to shoot dance. One of their pros has been super supportive of me, so it has been a fantastic work/learn experience. I NEVER thought they would ever use any of my shots in their promotional material. The closest I got was when the board considered using one of my B&Ws on a T-shirt (it was shelved in favor of one of the pro shots). I nearly fainted with that one. With the latest photo, I think the whole neighborhood heard my screams. I've already bought by shepherdess outfit and its non-returnable.